Mount St Helens is located in the Cascade mountain range in the state of Washington in the United States and is famous for its devastating 1980 eruption. Mount St Helens sits on a destructive boundary where North American and Juan de Fuca plates meet. These tectonic plates move due to convection currents in the mantle. In this instance the plates were moving towards each other where they collided. The denser and heavier oceanic plate was subducted beneath the continental one. Rising temperatures, due to the presence of magma and frictional effects, caused the crust to begin to melt, adding to the existing magma. As a result of the melting, bubbles of gasses were produced, forcing the magma to rise closer towards the surface, raising the pressure even further. Due to the immense pressure an large earthquake was triggered which measures 5.1 on the Richter scale. This created a large bulge on the north section of the volcano. Over many months this grew larger, eventually due to the extreme pressure this collapsed instantly causing a catastrophic landslide. 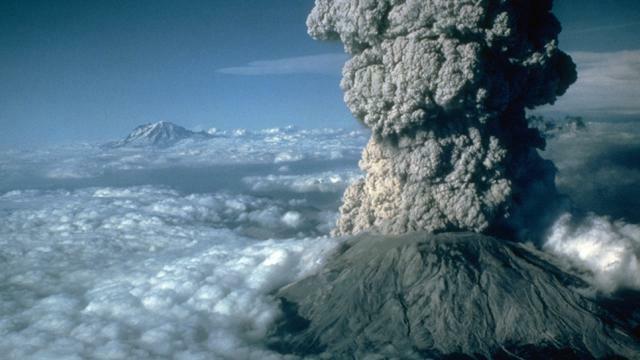 This suddenly released the huge pressure and strain on St. Helens, explosively expelling the stored gas and steam causing the famous and violent eruption. What makes Mt St Helens unique is that the eruption occurred laterally (horizontal eruption) blast. This lateral blast caused the infamous pyrcoclastic flow. The United States Geological Survey began issuing warnings to people living in the area, and briefed the Forest Service. 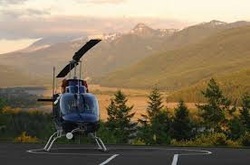 They began to close access roads into the mountains and to clear the surrounding area of tourists. These early actions were a calculated risk. As always there was a balance to be made between warning and protecting people, and causing panic or issuing a false alarm. Undoubtedly though, thousands of lives were saved by the evacuation and closure of the area. Geologists installed highly sophisticated equipment on the mountain. They constantly monitored the chemical composition of groundwater and escaping gasses, they used laser surveying techniques to look for any expansion of the ground, and recorded the constant seismic activity. The side of the mountain was clearly beginning to expand as pressure began to increase. By late April there was a bulge 1000m wide and over 2000m long. It was rising at a steady rate of about 1.5m every day as the mountain began to fill with magma being forced up from below. The gas eruptions were also being very carefully monitored. Erupting volcanoes give off large quantities of sulphur dioxide gas, SO2 (the one that smells of rotten eggs ), so any increases in the emission of this gas might have suggested an impending eruption. Transport links were destroyed. These included roads, bridges, railways. Several airports were closed with 1000 flights being cancelled due to poor visibility caused by the ash cloud. 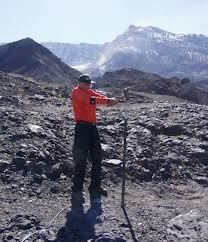 Lava and ash melted snow and ice forming a lahar (a flowing mixture of water, loose rock and debris). These can flow at speeds between 10 and 60 mph. These travelled into the Toutle and Cowlitz rivers and damaged 35 bridges. 3 million m3 of material was transported 17 miles (27 km) into the Columbia River by these mudflows. The eruption caused a huge landslide of flowing debris, this is called a pyroclastic flow. This rushed down the mountain at speeds of 300mph and with a temperature of 350. This destroyed 250 houses, 185 miles of road and 15 miles of railway. 4 billion trees were cut down. Enough to build 300,000 two-bedroom homes. Volcanic bombs were thrown into the fiery air, up to 8 miles from the eruption, crashing into the ground somewhere already obliterated by the pyroclastic flow, contributing relatively little damage. Those within the immediate blast zone were evacuated immediately.